Yes, that's me - the "expert". All you have to do is tell people that you are a birdwatcher, and you become the expert. I am by no means an expert birder. I cannot identify the one Western Sandpiper in the flock of thousands of Least Sandpipers like some people can. I cannot identify the migrating songbirds flying overhead at the Higbee Beach platform. I cannot even identify most of the hawks flying past Hawk Mountain unless they are really close or the professional counters shout out the name. I'm getting better at bird songs, but still get fooled by Titmice. Even though I know that I'm not an expert, non-birders continue to rely on me to identify all kinds of sightings, and answer all kinds of bird behavior questions. As referenced by my last post - my mother sent a photo of a hawk in her backyard asking me to identify it. Coworkers ask me to identify birds based solely on their terrible descriptions of "the finch that is making a nest in my hanging plant" - turned out to be a House Wren. On and on . 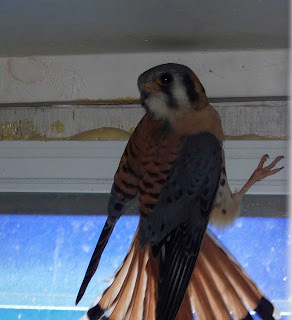 . .
American Kestral - a Falcon! Inside the rowhouse in Mayfair. How in the world did it get into the house, nobody knows. But at least it's outside now. Thanks to Brian for having the wherewithall to take a few photos, or I would never have been able to render my expert identification.